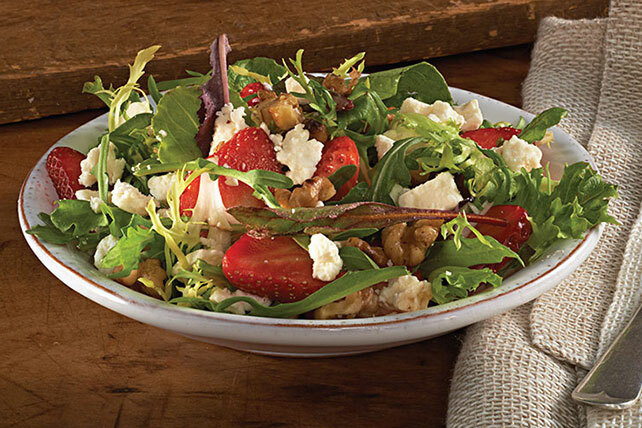 Discover the tangy and sweet flavor combinations in our Strawberry Feta Salad. Strawberry-Feta Salad is a deliciously refreshing dish perfect for summer. Prepare using baby arugula instead of the mixed baby greens and/or toasted PLANTERS Sliced Almonds instead of the walnuts. Or, use your favorite combination of tender salad greens and your favorite toasted chopped PLANTERS Nuts. The walnuts can be glazed before adding them to the salad. Just combine nuts and 2 Tbsp. sugar in skillet; cook and stir on medium heat 3 to 5 min. or until sugar is melted and nuts are evenly glazed. Cool completely.